Easily the best known of Plautus' plays, Menaechmi's popularity has rested on its broad farcical humor and exuberant dialogue. This edition aims to make a first reading the enjoyable experience it was meant to be. Designed to offer a first reading of Plautus to third-semester college or second- or third-year high school Latinists, this book's approach to vocabulary is to include places and familiar words in a general vocabulary at the end of the book, while new words are displayed opposite the text. 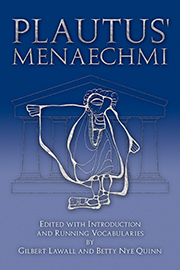 Lawall and Quinn’s edition of Plautus’ Menaechmi is aimed at second and third year high school classes or second and third semester college courses.... Lawall and Quinn’s Menaechmi has facing text and running vocabulary, with entries grouped by line number. In the back is a lexicon of words prescribed by the second-year College Boards Examination, and these are not given opposite the text. Macrons are employed in the text, but not in the vocabularies, to mark long vowels.... But I am being captious; the editing on the whole is quite careful, and errors are few. As for the overall format, preferences are probably a matter of taste. I tend to find the very full vocabularies, which may define forty words for fifteen lines of text, cumbersome, but students may feel frustrated if they cannot check at a glance even obvious terms such as odor or amator. Grammatical notes are kept to a minimum, and often a translation is made to serve, but more elaborate explanations are probably best left to the teacher at this level. The brief general introduction and occasional questions at the foot of the page concerning evaluation or interpretation of scenes are helpful. While Moseley and Hammond’s Menaechmi would still be my choice for a third-year class, I look forward to a chance to try Lawall and Quinn in the second year. This new edition is intended for second-year Latinists....it might very well be attractive over here for the first reading of Plautus. The authors’ practice with vocabulary is that words which may be expected to be already familiar at that stage of Latin are in a general vocabulary at the end; all others are glossed opposite the text line by line, except that those which have occurred several times are given a final, asterisked, entry, and appear (also with an asterisk) in the general vocabulary. This seems very sensible, and is carried out with accuracy. Verbs are given their principal parts, nouns their genitive and gender, both of which are a notable improvement on the practice of, for example, Libellus. The book is eminently helpful, intelligently presented, and reflects the editors’ care and understanding. The University of Massachusetts Menaechmi, reviewed in the Autumn 1980 issue of this Bulletin, is now in a second edition, available over here from the Bristol Classical Press. I described it then as eminently readable, intelligently presented and reflecting the editors’ care and understanding; and have no reason to change that judgement. Some improvements have been made: three errors in the text have been corrected; pronunciation of the Latin is helped by the consistent marking of long vowels; the play is divided into acts, and a five-page detailed summary of the plot has been added to the Introduction. With the running vocabularies, this would be a perfectly good play for the first reading of Plautus at quite an early stage. Plautus’ Menaechmi, edited by Gilbert Lawall and Betty Nye Quinn and now in its second edition, sets out to make Plautus attainable and enjoyable for sixth formers and first year undergraduates. The format is admirable: vocabularies face the text, which is interrupted from time to time to admit stage directions, and notes on language and on essential background are placed with the vocabulary, while occasional questions about the play and about wider issues of social life (e.g. 889ff., ‘Is this scene a burlesque of the fashionable doctor or is it a straight portrayal of an important professional? What is the status of the doctor in this period?’) are set at the foot of the relevant page. All this, together with the detailed summary of the plot which ends the introduction, should ensure that a tiro reads accurately enough to please the strictest teacher and fluently enough not to lose sight of the plot and the humour.